The Regional Development Council (COREDES) is launching several projects in priority areas for the regional development of Guanacaste. The projects are related to water access and water infrastructure; agricultural and fishing productivity; housing, education, health and culture; research and innovation; employment and production, and road and airport infrastructures. After its creation in June 2016, COREDES, through five working groups, oversees 159 impactful regional projects, 50 of which are already implemented, 99 being executed now, and 10 in the preparation process. At the end of July, an accountability meeting took place in which many important authorities were present, among them, the President of the Republic Luis Guillermo Solís Rivera; the First Lady and Coordinator of the Tejiendo Desarrollo Program, Mercedes Peñas Domingo; the Minister of National Planning and Economical Politics (MIDEPLAN), Olga Marta Sánchez Oviedo; the Minister of Environment and Energy (MINAE), Edgar Gutiérrez Espeleta; the Executive President of the Costa Rican Institute of Aqueducts and Sewage (AyA), Yamileth Astorga; and the General Manager of the Costa Rican National Service of Underwater, Irrigation and Drainage (SENARA), Patricia Quirós Quirós. Among the main results obtained through this initiative, called the Tejiendo Desarrollo Program: it has invested ₡ 5,671 million in 15 projects of regional impacts to 3,929 beneficiaries, has promoted 13 regional initiatives of the Social Solidarity Economy, with an investment of ₡33,232 million aimed at 4,520 beneficiaries and has provided technical assistance, financing and training to Municipalities within the region. In terms of water, the Chorotega Region has received an investment of more than the ₡453 billion, aimed for 52 infrastructure management and development projects that guarantee sustainable management and access to water to the communities as well as economic and social development. The Comprehensive Water Supply Program for Guanacaste (PIAAG) executes and seeks solutions to the drought emergency due to the El Niño phenomenon that affects the region. In this field, since 2014, AyA has prioritized 7 infrastructure projects for more than ₡39 billion, drilled 28 wells in 2016 and 12 more during 2017, with an investment of more than ₡800 million. One of the PIAGG’s projects is the “Water Supply System for the Tempisque River and Coastal Communities (PAACUME),” which seeks to bring water for irrigation and human consumption to benefit families, communities and productive sectors within the cantons of Santa Cruz, Carrillo and Nicoya, availing the waters in the Arenal Tempisque Irrigation District (DRAT), derived from the Arenal – Dengo – Sandillal Hydroelectric System (ARDESA). Despite the difficulties faced by the nature of the project, progress has been made in terms of construction and environmental impact assessment studies; it is expected that it will be operational by 2022. 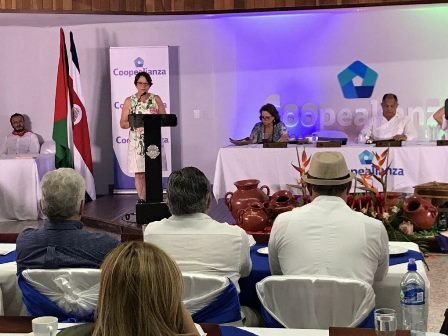 In the framework of the 193rd anniversary of the Annexation of the Nicoya Party to Costa Rica, the authorities said that COREDES, as a place for dialogue and agreement, will continue to follow up on the strategic projects that have strongly promoted the development of the Chorotega Region.